Cannabis activists are stepping up in a huge way at the Democratic National Convention. 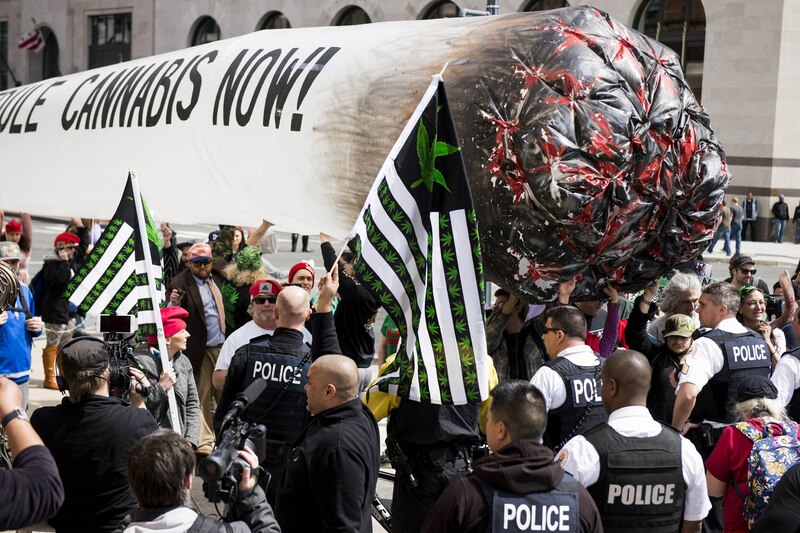 Protestors marched at the Philadelphia City Hall, carrying not one, but two, giant, inflatable joints, in what supporters are calling “Jaywalk to DNC.” While there were also cannabis supporters protesting at the Republican National Convention, the DNC walk took the cannabis cup. Protestors lined Philadelphia City Hall carrying two, 51-foot, inflatable joints right into the heart of their debate. The activists also lit up real joints, smoking freely in public in a city where cannabis is not recreationally legal. While there were no unruly protestors, they were noticeably more agitated and organized at the DNC than they had appeared to be at the RNC. Kate Grumke and Eugene Daniels, who were covering the story for Newsy, noted the difference from one convention to the next. Over the last week, Democrats have been reeling over the findings that the DNC may have played favorites between candidates Hilary Clinton and Bernie Sanders. After a slew of emails between members of the DNC were released, citizens believe the evidence clearly shows bias among the party and that they never intended to let Sanders be the official candidate. Tensions only grew when DNC’s Chairperson, Debbie Wasserman Schultz, resigned after the leaked emails, only to be hired onto Clinton’s campaign moments later. If that doesn’t spell “rigged system” I’m not sure what does. During the DNC’S opening ceremonies and prayer service, protestors being shouting “Bernie, Bernie, Bernie,” in the hopes their voices would be heard. What do you think of the protests at the DNC? Let us know on social media or in the comments below.